TensorFlow is a deep learning framework that provides an easy interface to a variety of functionalities, required to perform state of the art deep learning tasks such as image recognition, text classification and so on. It is a machine learning framework developed by Google and is used for designing, building, and training of deep learning models such as the neural networks. The Google Cloud Vision and AlphaGo are some of the examples of the applications built on top of TensorFlow. TensorFlow is an open source library and can be download and used it for free. In this article, we will see how to install TensorFlow on a Windows machine. When installing TensorFlow, you can choose either the CPU-only or GPU-supported version. I'd recommend to install the CPU version if you need to design and train simple machine learning models, or if you're just starting out. However, the CPU version can be slower while performing complex tasks, especially those involving image processing. If you need to use TensorFlow to process a huge amount of data, especially cases in which the data involves images, I'd recommend installing the GPU-supported version. GPU supported TensorFlow requires you to install a number of libraries and drivers. It supports NVIDIA GPU card, with support for CUDA Compute 3.5 or higher. TensorRT for improved latency and throughput. On Windows, TensorFlow can be installed via either "pip" or "anaconda". Python comes with the pip package manager, so if you have already installed Python, then you should have pip as well. The package can install TensorFlow together with its dependencies. Anaconda is also a great option for installing TensorFlow, but it is not shipped with Python like pip is, therefore you must download and install it separately. Both packages are open source, so feel free to choose the one you like. To get the pip package manager, you first need to install Python. Download the latest version of Python from the official Python website and install it. Since you have installed the latest version of Python, that is, Python 3.x, you have pip3, and not pip. The latter was used with Python 2.7. It is now finally time to install TensorFlow. Run the windows command prompt as an administrator. To do so, go to the start menu on your Windows machine, search for "cmd", right click it and choose "Run as administrator". And that's it! You can now skip to the section "Verifying the Installation" below to make sure it installed correctly. 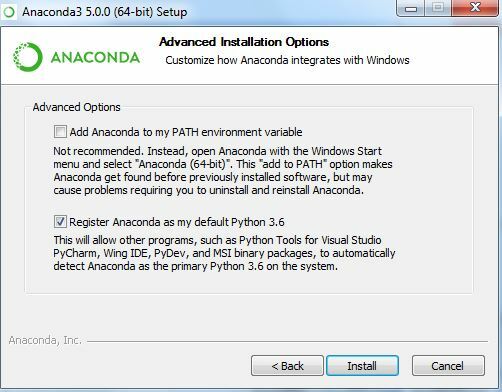 Python is not shipped with Anaconda, so you must first install it on your system. You can download it from Anaconda.com. Once the package is downloaded, double-click it to start the installation. 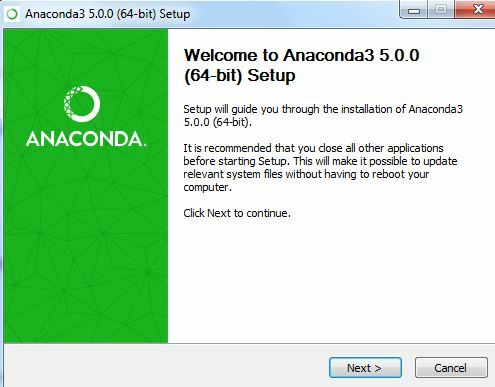 Installation instructions for Anaconda can be found at this link. The installer will be verified and a welcome window will pop up. Click "Next". In the next window, you will be required to accept the terms of the Anaconda agreement. Click "I Agree". You will be prompted to choose the installation type, whether just for you or for all users. Choose the option you need and click "Next". You can install it in the default directory or browse to another directory. Click "Next". You will see the window for "Advanced Options". 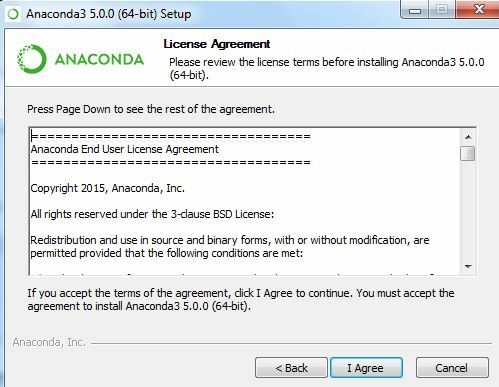 Check the second checkbox, that is, "Register Anaconda as my default Python 3.6". Click "Install" and the installation process will begin. 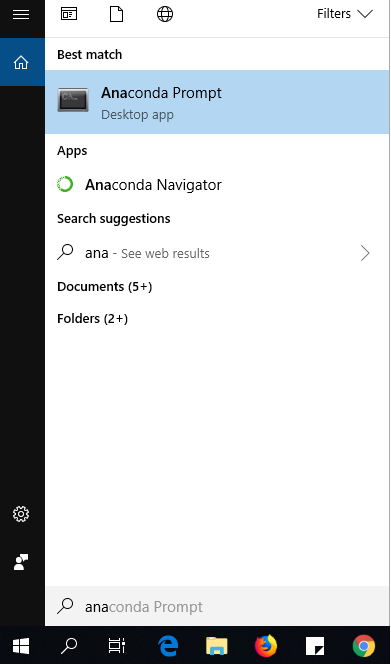 Click "Next" and "Finish" in the subsequent windows to complete the installation of Anaconda. 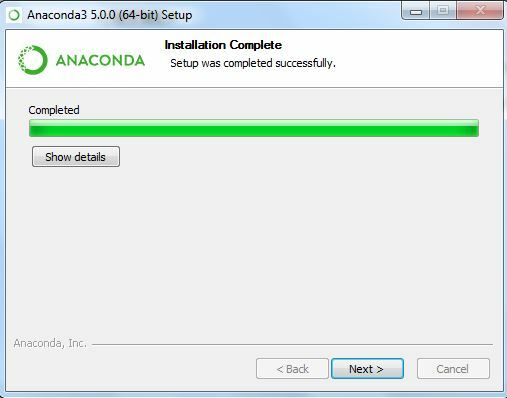 Now that you have installed Anaconda, you can use "conda", a package manager used for the management of virtual environments and installation of packages for Anaconda. We will now create a Python virtual environment with conda. A virtual environment is an isolated working copy of Python, capable of maintaining its own files, paths, and directories so that you can work with specific versions of the different Python libraries without affecting the other Python projects. Let us name the environment as tensorenviron. Although you can use any name you want. You will be prompted to allow the process to proceed. Just type "y" for "yes" and press the enter key on your keyboard. The environment will be created successfully. You will see the prompt change. A list of packages to be installed alongside TensorFlow will be shown. The command will prompt you to confirm the installation of these packages. Type "y" and then press the enter key. The progress of the installation process will be shown on the command prompt. Now that TensorFlow has been installed, we can verify whether the installation was successful or not. To do so, we can run Python's import statement and see if we can successfully import the TensorFlow library. If everything is okay, the command will return nothing other than the Python prompt. However, if the installation was unsuccessful, you will get an error. Just starting out with TensorFlow? Getting it installed is just the first step. If you want to learn more beyond this then we recommend trying a more detailed resource, like the Complete Guide to TensorFlow for Deep Learning with Python online course. You'll learn everything from TensorFlow basics to Generative Adversarial Networks with TensorFlow. TensorFlow is a machine learning framework used for the development of deep learning models. The framework was developed by Google, and comes in two flavors, the CPU-only, and the GPU-supported versions. The latter is more powerful than the former and is more suitable for image processing tasks. In this article, we saw how we can install TensorFlow on a Windows machine using pip command as well as through Anaconda framework.